Many visitors to the gallery tell us that even though they have lived here for years, they have never noticed that 314 Mill Street is a gallery. One of the goals of the mural is to invite passersby to stop and take a closer look at the building. 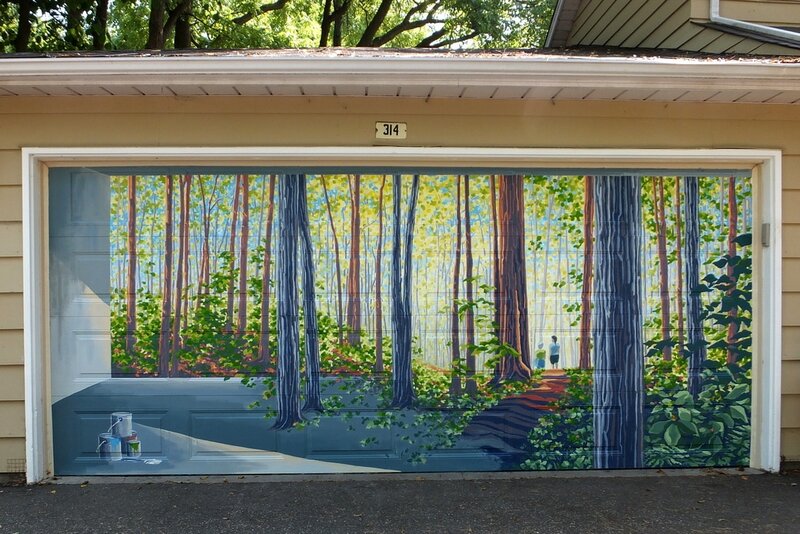 As they look at the mural on the garage door they may also notice our gallery sign and see that they can come in and see more artwork inside. The view into the garage shows that the painting is not quite finished, it is still a work in progress. The forest with its welcoming path into the sunlight is also an invitation. Come and enjoy our parks and pathways. Is it the artist that has left the work to take a stroll? The subject is a nod to our artists at work, to the space being a gallery, to the beautiful park that we are located in. It is an invitation to come closer, to come inside, and to enjoy the setting.